Acupuncture is a healing modality that in many ways must be experienced to be believed. Although it has been utilized in Traditional Chinese Medicine for over 2500 years, it is still faced with skepticism in the US. Regardless, this healing practice is very popular in China, as well as, Japan and Korea. The word “acupuncture” means “to puncture with a needle.” And, although there are forms of acupuncture that do not use needles, in general acupuncture utilizes ultra-thin, metal needles to gently pierce and stimulate points throughout the body. Those “acupuncture points” are aligned with the twelve meridians, or energy channels that run up and down the body. When these points are stimulated, energy blockages are released therefore enabling the body’s qi (energy) to flow freely through the meridians. In Chinese Medicine all illness is perceived as an imbalance in energy flow, so acupuncture is a means of rebalancing the body and returning it to health. Compiled from “Acupuncture: review and analysis of controlled clinical trials” WHO, 1999. Accreditation Commission for Acupuncture and Oriental Medicine (ACAOM) – http://www.acaom.org/ – the commission that provides accreditation for acupuncture education in the US. Find an accredited acupuncture school through their search tool. 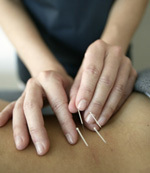 Acupuncture.com – www.acupuncture.com – a site covering Traditional Chinese Medicine and acupuncture. Their www.acufinder.com section offers a search function for finding acupuncturists, schools, and classes. *The site sells books and herbs, and requires practitioners to pay to be listed in their directory, so there is some bias. “Acupuncture: Bottom-line Monograph” – a review from Natural Medicine Journal which includes an interesting chart ranking the effectiveness of acupuncture on specific health concerns. Acupuncture Today – www.acupuncturetoday.com – a monthly publication with a free newsletter covering acupuncture and Traditional Chinese Medicine topics. The site includes heavy advertising, but the information is comprehensive and a variety of resources are provided. Their “Links” page includes acupuncture organizations by state. There is an Acupuncturist Locator but it appears that those listings are paid for by the practitioner. ChineseMedicineSampler.com – Acupuncture – www.chinesemedicinesampler.com/acupuncture.html – a simple overview of the principles of acupuncture. Gancao.net – www.gancao.net – a site from Al Stone, L.Ac., DAOM offering research and tools for Traditional Chinese Medicine and acupuncture. Hartford Hospital – Acupuncture –www.harthosp.org/integrativemed/Therapies/Acupuncture/default.aspx – an overview on acupuncture including an interactive glossary of terms. Healthy.net – Acupuncture – www.healthy.net/Alternative_Therapy/Acupuncture/1 – a variety of articles and overview information on acupuncture. *This site sells products so some information could be biased. Institute for Traditional Medicine and Preventive Health Care, Inc. (ITM) – Acupuncture – www.itmonline.org/acupuncture_ed.htm – a nonprofit providing information and research on Chinese Medicine and acupuncture, along with Chinese herbal formulas. The National Acupuncture & Oriental Medicine Alliance – www.acuall.org/natl.htm – this group’s National Organizations page includes numerous US agencies offering information on acupuncture. National Institutes of Health – Acupuncture Consensus Statement – http://consensus.nih.gov/1997/1997acupuncture107html.htm – details from the 1997 report assessing the effectiveness of acupuncture. New England School of Acupuncture – http://nesa.edu – an accredited school (from the Accreditation Commission for Acupuncture and Oriental Medicine (ACAOM)), that offers advanced degrees in acupuncture and Chinese Herbal Medicine. Acupuncture: review and analysis of controlled clinical trials WHO, 1999 – http://whqlibdoc.who.int/publications/2002/9241545437.pdf – a thoroughly researched and complete review of acupuncture studies documenting the numerous conditions in which it offers relief. Report by Dr Xiaorui Zhang, Acting CoordinatorTraditional Medicine (TRM),Department of Essential Drugs and Medicines Policy (EDM), World Health Organization. Acupuncture the WHO (World Health Organization) View, 1979 – www.who.int/features/2009/photoarchives/traditional_medicine/photo_story/en/index.html – a slideshow depicting the use of acupuncture in China in 1979. “Acupuncture: review and analysis of controlled clinical trials”– by Dr Xiaorui Zhang, Acting Coordinator Traditional Medicine (TRM),Department of Essential Drugs and Medicines Policy (EDM), World Health Organization. WHO, 1999.